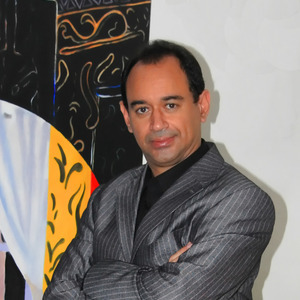 Enriquillo Amiama belongs to a new generation of Dominican artists who have appropriated the formal and conceptual characteristics of the historical vanguards. As a pioneer in the plastic flow, since 1983, consistently, fuses elements characteristic of symbolism, abstraction, hyper-realism, as well as emblematic iconography artists. From the reuse of anachronistic aesthetics of appropriation and paraphrasing, has created a proper style that could be defined as a new pop art, whose theme and concept as expressed in paintings, installations, videos, digital art and more today using the middle "Facebook" as a plastic substance. Dr. Belgica RodrÃ­guez Former President of International Association of Art Critics, AICA, ONG of UNESCO, actually she is Honor President Ad Vitam of AICA Former Director of Art Museum of the Americas, OEA, Washington, D.C. for 7 years. President of the Iberoamerican Art Fair, Seoul (IAAF) Juror at most of the WorldWide Art Biennials and writer of important art books and essays.